Carol Snyder’s chapter book Ike and Mama and the Once-in-a-Lifetime Movie, first published in 1981, tells a story of Ike Greenberg and his friends, kids who lived in the Bronx shortly after the end of World War I. 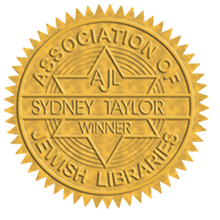 In some ways the book mirrors Sydney Taylor’s All-of-a-Kind series, in that it takes place in New York City in approximately the same time frame and describes details of day-to-day life for many immigrant Jewish families in that time and place. The story is fast-paced, echoing the speed at which life seemed to be lived in the city. There is a sweetness about the characters whom the reader gets a chance to know as the story progresses. While Ike and his friends “lived” a hundred years ago, they are also realistic characters who deal with siblings, begin to expand their horizons beyond home and family, make mistakes, and deal with consequences, as all children do. Of course, the character of D. W. Griffith was a real person -- one with a very troubling history. His movie The Birth of a Nation contained racist content that created lasting harm. This book’s fictional account makes no mention of that legacy, but some families may wish to raise a discussion about this with their children. Others may choose to focus on the story, which includes a snowstorm, lost money, the excitement of big-city streets, a famous movie director, and just enough mischief to be tantalizing for young readers. And that’s why we chose this book. Do you have a book perfect for PJ Library? Visit the Authors' Page.